Sometimes the eyes have it. But for a surgeon, a little X-ray vision never hurts. While X-ray vision doesn’t exist, medical technology can sometimes hint at our comic book fantasies.Sometimes the eyes have it. But for a surgeon, a little X-ray vision never hurts. While X-ray vision doesn’t exist, medical technology can sometimes hint at our comic book fantasies. 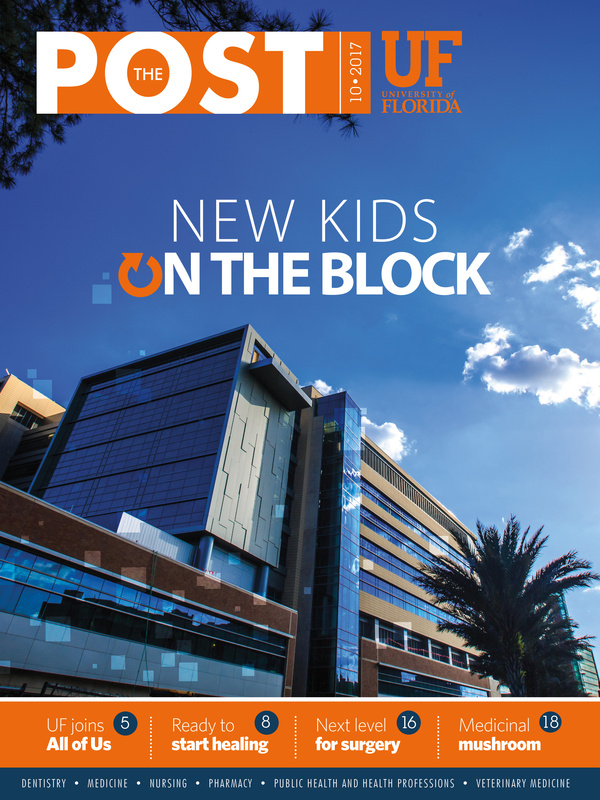 A UF Health orthopaedic surgeon is one of two nationally to perform the first computer-assisted shoulder replacement surgery in the U.S. using a new technology allowing live navigation of the operative site. The technology, ExactechGPS Total Shoulder Application, provides the surgeon with a real-time 3-D computer model of a patient’s shoulder during surgery. It does this by combining CT scan images with data from instruments mounted with tiny infrared cameras. The combination gives the surgeon a road map for placing implant screws with tolerances of 2 millimeters, besting what is possible with the human eye. The technology is expected to produce more durable implants with fewer complications. Thomas Wright, M.D., a UF College of Medicine professor and surgeon with the UF Health Orthopaedics and Sports Medicine Institute and director of the Interdisciplinary Center for Musculoskeletal Training and Research, performed the surgery. He was assisted by Larry D. Waldrop, M.D. The surgery was done simultaneously with an identical procedure performed on a second patient in Hendersonville, North Carolina. The two physicians are design surgeons with Exactech, a Gainesville-based medical device manufacturer, and they shared the honor of being the first in the U.S. to use the technology. Mercia Reid, 74, a retired home care aide, agreed to be one of the first two U.S. patients. She has severe arthritis, and Wright already had performed a successful shoulder replacement on her left shoulder before deciding surgery was necessary on the right shoulder, too. During Reid’s surgery, Wright and Waldrop carefully positioned a drill as they checked a computer tablet screen with a digital crosshair showing the surgeon’s planned drill placement on the bone. As they moved the drill, a green dot moved toward the target. When the dot aligned with the crosshair, the surgical team had a far more precise drilling point than can be done with the human eye. For someone like Wright, that difference might be small. But Exactech’s technology will allow low-volume surgeons to place bone screws far closer to the mark. The software allows surgeons to virtually plan the operation using a 3-D anatomical model of the patient’s shoulder with images from a CT scan. Wright noted it can be difficult to get a complete view of the patient’s shoulder anatomy during the actual surgery. But the software allows the surgeon to guide a bone drill mounted with an infrared camera to the exact location plotted out during pre-op planning, determine drilling depth, screw placement and the ability to adjust the pre-op surgical plan. The cameras communicate with a computer tablet that displays a digital model of the patient’s shoulder so a surgeon knows his exact position within the shoulder. “It’s the truest thing to X-ray vision that we can get,” said Jason Osier, clinical sales manager with Exactech.